Design encroaches onto neighbouring childcare facility; Architect threatens that the Mole Hill Greenway could be “dramatically changed”. On May 17th Mole Hill Community Housing Society was contacted by Timothy Ankenman, the architect of the proposed development at 1150 Comox Street. He said the images used on the posters for the 26th May public meeting regarding the future of Mole Hill are incorrect. Mr Ankernman said the City of Vancouver website is out of date and the current plans have not been made public. Following an email to the city, the redevelopment plans for the Mole Hill property were finally revealed on May 18th. It is frustrating and deeply unfair to the community that the current proposal has been kept private until today — only two weeks until the Director of Planning makes a decision, and almost 3 months after being approved by the Heritage Commission. Mole Hill is a 170 unit social housing development and a model for sustainable community. It’s internationally renowned heritage landscape contains more listed heritage buildings than any block in the City of Vancouver. Awards for Mole Hill include the Heritage Canada Award, the City of Vancouver Heritage Award of Honour, the Canadian Construction Association’s Environmental Achievement Award and a CMHC Housing Award for Best Practices in Affordable Housing. The proposed redevelopment seriously compromises such achievements, by dominating its surroundings, being ostentatiously modern, and requiring gross bylaw exemptions in terms of site coverage, height, siting, size, etc. The design illegally encroaches on the neighbouring property, which contains two specially adapted daycare facilities belonging to the Mole Hill Community Housing Society. About 400 square feet are incorporated into the new development, removing structures and landscaping which do not belong to the developer. The Society noted this encroachment in earlier design proposals and 6 months ago informed the city that it would be impossible. However the encroachment remains in the plans made public today. The tree in question belongs to the Society so its removal is not in question. The larger issue is that our award-winning Mole Hill greenway would be “dramatically changed” unless the Society gifts a significant parcel of land to the developer, Vandwell Homes (owned by Mr. Jerry Rakhra.). It is highly unlikely that City of Vancouver Engineering, Planning and Heritage departments would allow changes to the lane to permit fire truck access, and the Fire Department would not approve the greenway as fire-fighting access. Rather, the solution is that the proposed building needs to be much narrower and provide fire access through their own sideyard, which would require major changes to the proposal. It’s amazing that the approval process at the City has proceeded so far when there is a glaring technical problem with something as basic as fire-fighter access. The developer, architect, owner & city staff have apparently negotiated these plans in private and have not engaged with the Society or the community, otherwise this would have been apparent earlier. 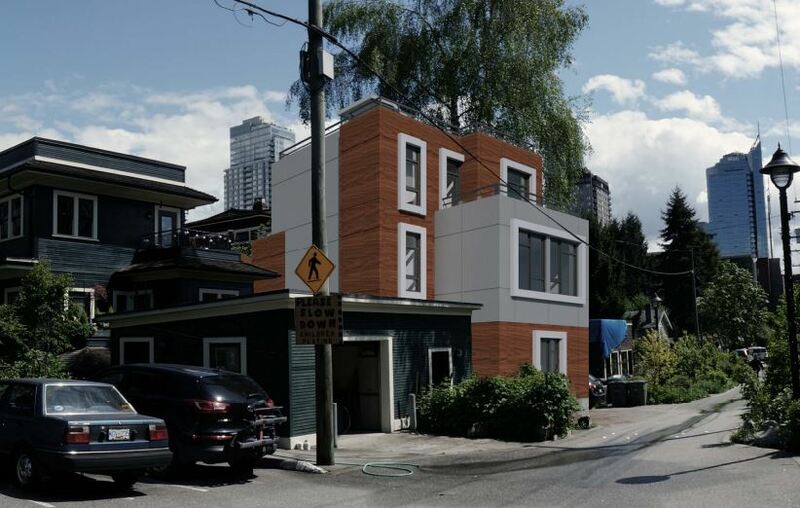 The Society suggests that proposals for the block must respect the current zoning bylaws, compliment the heritage landscape, and observe the established one-story massing adjacent to the laneway. Thursday 26th May at 6:30pm; Mole Hill Common Room, 1157 Pendrell Street, Vancouver. Questions? Contact Quentin Wright, Executive Director, Mole Hill Community Housing Society. TELL THE SCHOOL BOARD: NO SUBSTATIONS UNDER VANCOUVER SCHOOLS OR PARKS! © 2013+ Mole Hill Community Housing. All rights reserved.